Apple is simplifying its streaming music service, starting with design. Apple Music has 15 million paying subscribers, which is nothing to sneeze at. But Apple’s Spotify competitor isn’t exactly easy to use, so iOS 10 is bringing a complete redesign. It’s a totally new look, with giant cards, bigger and bolder fonts, and a clean white background that allows the album art to shine. 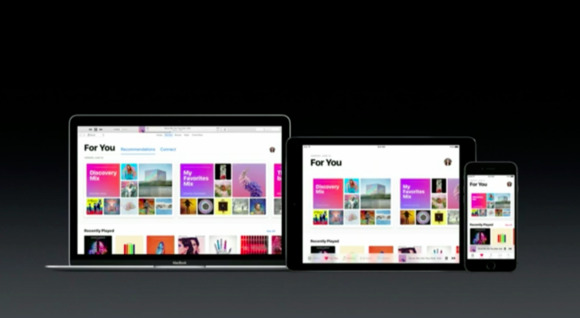 Apple Music’s redesign emphasizes vivid images. The first tab when you open Apple Music in iOS 10 is your Library, which makes the most sense. Currently Apple Music buries your library of songs under My Music on the far right side, then further divides it into two sections, Library and Playlists. The categories are nonexistent, and it’s easier to search for something you have saved than to browse your own library. That’s about to change. The Apple Music library in iOS 10 is divided into five sections: playlists, artists, albums, songs, and downloaded music. Downloaded music, which is brand new, is where you’ll find every song you have downloaded. Apple Music is adding lyrics to songs in your library in the mini player when you’re listening to a song, which is a solid design decision that cuts down on clutter (something Spotify still struggles with). Lyrics will show up in Apple Music’s mini player when you’re listening to a song. For You is getting a revamp, too, and not just a new look. In addition to the curated playlists that Apple Music always recommends to you, the streaming service is adding a Discovery Mix to the top of the list. That playlist is designed to take on Spotify’s popular Discover Weekly feature, a totally personalized playlist that refreshes every week. For You also stashes your recently played tunes and daily curated playlists. Connect isn’t going away, though Apple Music’s social feature for musicians will no longer have its own tab in the app. Instead, material from artists you follow will show up in For You. That’s not a change I’m sure I can believe in, but as long as Connect isn’t taking up useful navigation space, it might not be so bad. A new search tab replaces Connect. Browse replaces New in the menu, making it a little easier to find the latest and greatest music. Browse puts a Hot Album at the top of the screen, so you know what everyone else is listening to. There’s also New Music, Top Charts, Curated Playlists, and more ways to comb through tunes. The one Apple Music feature that isn’t changing: Radio. Beats 1 still anchors the section, which also lets you queue up stations based on artist or genre. And popular Beats 1 shows like Elton John’s Rocket Hour aren’t going anywhere, either. Apple Music’s simplified interface and Discovery Mix might make it more appealing to people who are new to streaming, though it’s doubtful the company will poach any die-hard Spotify fans. 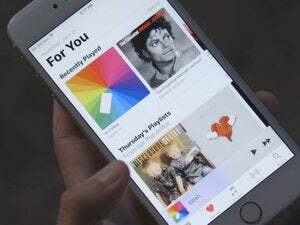 It’s also unclear if Apple has resolved Apple Music’s most misunderstood feature: how it integrates with your library of owned music via iCloud Music Library. Apple Music’s major upgrade is part of iOS 10, which launches this fall.